LJ Horners We make really good sausage rolls. 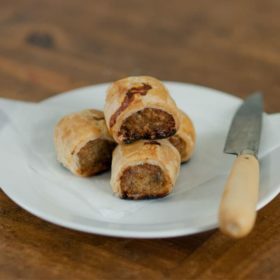 A note for veggies: although the vegetarian sausage rolls are wrapped together in paper, and do not touch the meaty sausage rolls, they do share a box with meat products. Order 2 or more and receive a 10% discount! Please enter “10” in the coupon box to redeem. Order 2 or more boxes and receive a 10% discount. Enter "10" in the coupon box to redeem. We ship on Wednesday afternoon every week. Our sausage rolls are made fresh to order, so please place your order by 5pm Saturday evening for the forthcoming Thursday delivery. If you are having a crisis and need a last minute delivery, we might be able to help, but please "contact us first before placing an order, or the delivery will be processed for the following week. 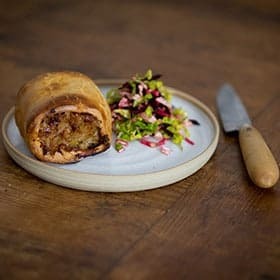 Our sausage rolls are wonderful for Christmas time. Perfect for feeding hungry hordes on Boxing Day. 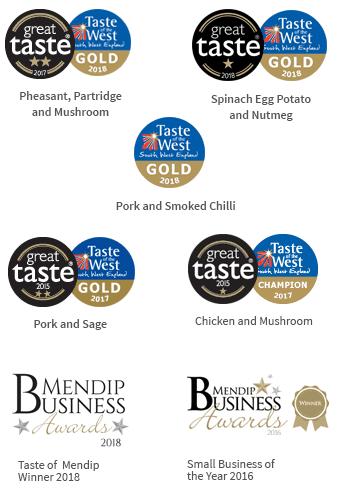 We have our festive Pheasant Partridge and Mushroom recipe available, and canapé options too, which you can purchase here on the website. We deliver to the whole of the UK. To the vast majority of the nation, it will be next-day delivery. However if delivery is to the following Highland and Island postcodes then there is a good chance of a delay to the arrival of your package which we cannot be held responsible for. Please make sure there is somebody in to receive delivery on the Thursday. If it is unlikely that anyone will be at home, consider delivery to your work address. If the package has to be re-delivered, the 24hr temperature control will be jeopardised! Our sausage rolls will be packaged in sturdy corrugated cardboard boxes. The boxes will labelled with cooking and refrigeration instructions. The boxes will be delivered within 24hr temperature controlled polystyrene food-fit boxes, surrounded by icepacks, to keep your sausage rolls fresh. Including the day of delivery, the sausage rolls will have a 7 day shelf-life. We have complete faith in the courier companies we use at Little Jack Horner's, but occasionally packages do become delayed in the post. The chances of this happening are very small, but if this does occur, we cannot be held accountable for the hold up. © 2013 - 2018 LJHorner's. All Rights Reserved.